The Savitzky Golay filter is a particular type of low-pass filter, well adapted for data smoothing. For further information see: http://www.wire.tu-bs.de/OLDWEB/mameyer/cmr/savgol.pdf (or http://www.dalkescientific.com/writings/NBN/data/savitzky_golay.py for a pre-numpy implementation). 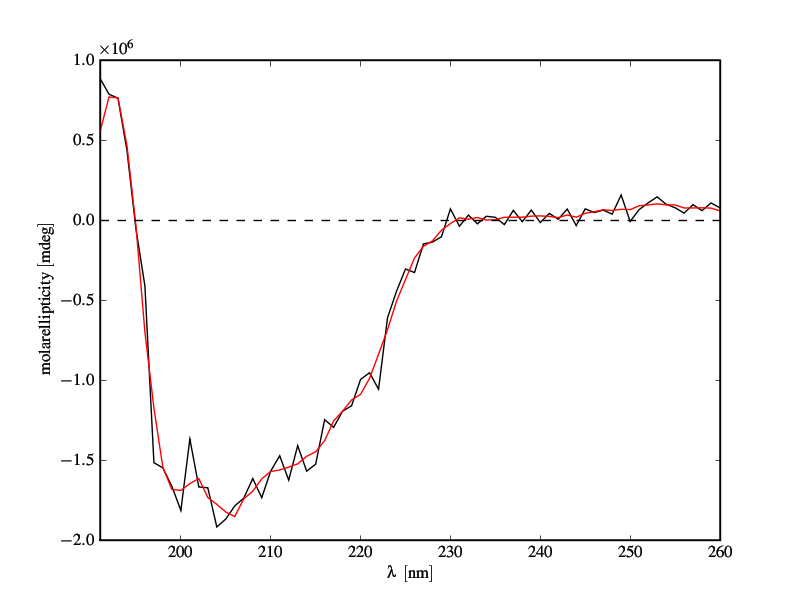 2     r"""Smooth (and optionally differentiate) data with a Savitzky-Golay filter. 3     The Savitzky-Golay filter removes high frequency noise from data. 6     approaches, such as moving averages techniques. 10         the values of the time history of the signal. 12         the length of the window. Must be an odd integer number. 14         the order of the polynomial used in the filtering. 15         Must be less then `window_size` - 1. 21         the smoothed signal (or it's n-th derivative). 44        Chemistry, 1964, 36 (8), pp 1627-1639. In lines 61-62 the coefficients of the local least-square polynomial fit are pre-computed. These will be used later at line 68, where they will be correlated with the signal. To prevent spurious results at the extremes of the data, the signal is padded at both ends with its mirror image, (lines 65-67). if xvals>xvals : #x is increasing? for each point of the two dimensional matrix extract a sub-matrix, centered at that point and with a size equal to an odd number "window_size". p(x,y) = a0 + a1*x + a2*y + a3*x2 + a4*y2 + a5*x*y + ... . Note that x and y are equal to zero at the central point. replace the initial central point with the value computed with the fit. Note that because the fit coefficients are linear with respect to the data spacing, they can pre-computed for efficiency. Moreover, it is important to appropriately pad the borders of the data, with a mirror image of the data itself, so that the evaluation of the fit at the borders of the data can happen smoothly. Here is the code for two dimensional filtering. 15     # exponents of the polynomial. 19     # second element for y. Since we have computed the best fitting interpolating polynomial surface it is easy to compute its gradient. This method of computing the gradient of a two dimensional function is quite robust, and partially hides the noise in the data, which strongly affects the differentiation operation. The maximum order of the derivative that can be computed obviously depends on the order of the polynomial used in the fitting. The code provided above have an option derivative, which as of now allows to compute the first derivative of the 2D data. It can be "row"or "column", indicating the direction of the derivative, or "both", which returns the gradient.